Your work style says a lot about you. Before you decide what to wear to work tomorrow, think about how your work style speaks volume about you. Whether you work in fashion world or a desk job, your 9 to 5 work style shouldn't be compromised. Let your work style introduce you and speak for you. 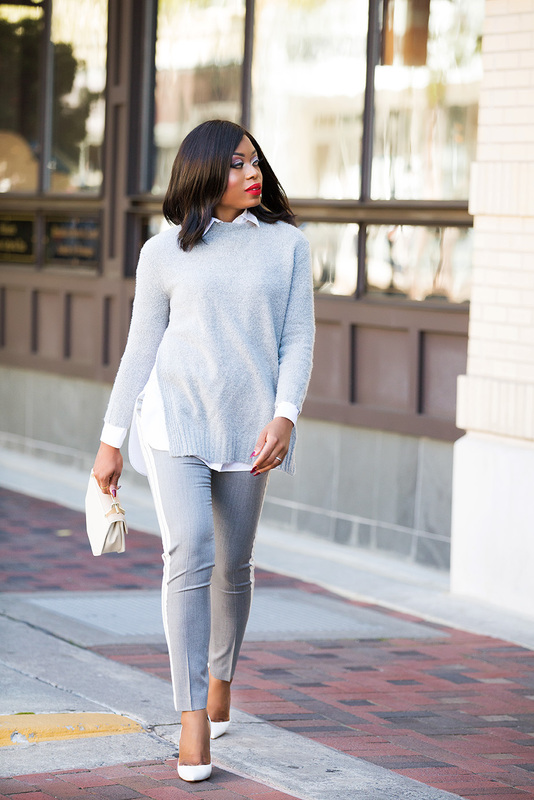 Today's work style showcases a fun way to wear grey tones for work. Grey is another substitute for those who want to switch up their black or navy work clothes. The color grey is safe, but can also be fun depending on how you style it. For this look, I went with grey pants with side stripe details. This white stripe detail sets the tone for how I style the whole look. 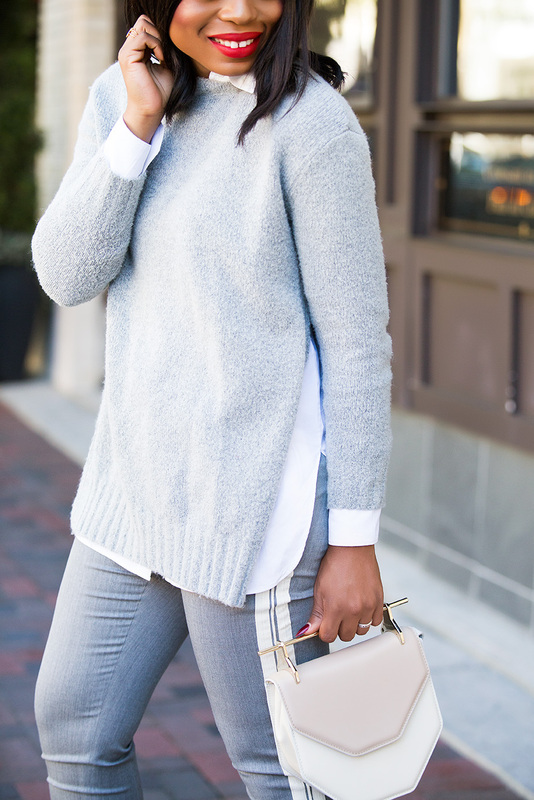 I layered the grey sweater with a white shirt to complement the pants. I completed the look with white pumps which also complement the pant details. If white pumps is too bold for you, beige or grey pumps are other alternatives. It is important to care what you wear to work - No matter how casual your work environment might be, it is important that you pay attention to what you wear. Casual work place does not equal wearing whatever you want. Ask yourself, is it ok to wear that top, pants etc.? Is the outfit appropriate for your work industry? Some work environment are conservative, while others are more relaxed and casual. Dress appropriate for your work industry. What's the purpose of your outfit: All clothes have a purpose. Don't wear clothes simply because it's casual and comfortable. For example, gym clothes is not a casual outfit for work. Don't be that person who is known for being over comfortable with their work clothes. Great tips Stella. I am known for ovedressing at work.Oh well someone needs to show them that you don't need to wear your on to come and teach teenagers. I love to also show my students that we don't need to see your boots and behind to be beautiful. I absolutely love this look and these grey pants with the side stripe details are Lovely.